San Francisco-based U.S. District Court Judge Edward Chen concluded in his 43-page ruling (pdf) that the TPS holders from those four countries and their children—including many who were born in the United States—would “suffer irreparable harm and great hardship” absent the court’s temporary injunction. The program was established in 1990 and grants protections to foreign nationals for various reasons, including ongoing armed conflicts, environmental disasters, and epidemics. A group of Sudanese beneficiaries were set to lose their TPS on Nov. 2. The Court finds that there is sufficient evidence that racism is a motivating factor behind Trump’s decision to terminate #TPS. Chen’s ruling, added New York Immigration Coalition executive director Steven Choi, “affirmed that this country is still governed by laws, not racially motivated tweets or rants. Referencing reports from January that during a closed-door meeting with Republican lawmakers, Trump referred to Haiti, El Salvador, and African nations as “shitholes countries,” ACLU of Southern California executive director Hector Villagra declared, “Shithole order blocked.” The decision was widely celebrated by the immigrant rights community and the plaintiffs. 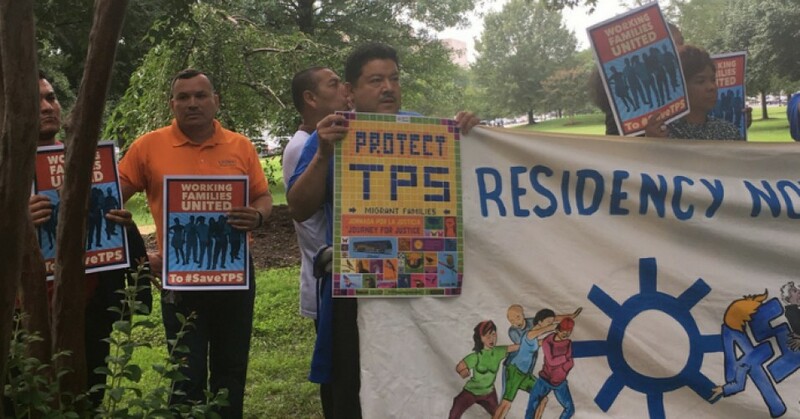 UNITE HERE has fought to protect TPS alongside other groups including the National TPS Alliance, CARECEN-Los Angeles, and African Communities Together. After the ruling, the labor union noted how organized protests—such as a historic blockade of the Port of Los Angeles by the Teamsters on Wednesday—have enhanced efforts to safeguard the program from the president’s attacks, and called on Congress to “create a roadmap to legal residency” for TPS holders. This is a big deal. Standing with all our TPS neighbors today.